Feeling very sporty, these latest Varsity items from Miel are just the coolest thing. Not only do they fill my ever wanting urge for a jacket of this style growing up, but also they are HUD aliscous. 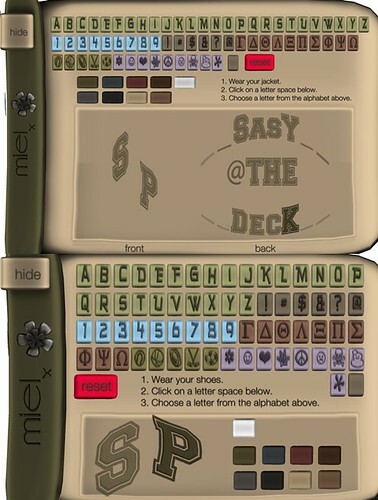 Not only can you change the colours of the shoes or jacket, but you can actually also change the lettering. I went with SP as Sasypants initials, but then hit a wall with the four four four config for the back of the jacket. Then eureka Sasy @ The Deck totally worked, feeling a bit like Jenny from the Block but whatevs. New hair New Hair, the gorgeous OSCAR style from LeLutka is all win, especially for those that have been pining away for more of the crimp frizz do looks already released. This one is a tad shorter and does come with an extra attachment of a braid, but I left it off, and am just in love with all the individual static hair pieces. They would have taken so long to place, amazing work. With the sporty look I am again wearing the new Zaara shorts this time with the actual cuffs. The cuffs are very cool as you get 7 options of print with them, as though the inside of your pants are actually lined with different fabric, yum. Wrapping it up, using the new poses from Ploom, even since yesterday there are new ones again…that collection is going to get huge before we know it.